Diva Vybes is a blog to encourage and empower women on this journey we call life. "There's a difference between interest and commitment. When you're interested in doing something, you do it only when it's convenient. When you're committed to something, you accept no excuses; only results." Are you committed or just interested in "living your best life"! Let's get committed and get those results! 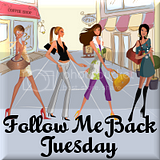 I’m already following your neat blog from Following Me Back Tuesday. I want to wish you & your family a great autumn! Check out my new Facebook fan page with inspiring quotes.